For 18 days we've been adding a new Birdorable bird every day as part of our Birdorable Bonanza 2010. We saved a very special bird for the final bird of our bonanza. Today's bird is the Birdorable Secretary Bird! Secretary Birds are large birds of prey native to sub-Saharan Africa. They have atypically long legs for a bird of prey, standing a whopping four feet high. Their distinctive look also includes their long scraggly head crest, featherless red faces and extremely long tails. They are like big crested eagles standing on towering crane legs! Wow! Three boys in South Africa made the news last week in a wildlife rescue story involving a Secretary Bird. The boys were alerted that another group of youths was stoning a Secretary Bird on their block. The hero boys grabbed the bird by the feet (good idea - those talons are dangerous!) and body and brought it back home. Wildlife experts were called in to care for the rescued bird, which is expected to be released back into the wild after rehabilitation. For 18 days we're adding a new Birdorable bird every day as part of our Birdorable Bonanza 2010. The Bonanza will be wrapping up soon! 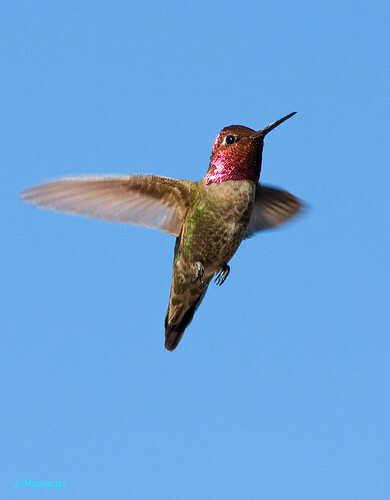 Today's bird is the Anna's Hummingbird! Anna's Hummingbird is a small species of bird native to the west coast of the United States. The species was named after Anna Masséna, Duchess of Rivoli, by French naturalist René Primevère Lesson. Tomorrow's bird will be the 18th and last in the Birdorable Bonanza. Can you guess what it is? For 18 days we're adding a new Birdorable bird every day as part of our Birdorable Bonanza 2010. Today's bird is the beautiful Bali Mynah! 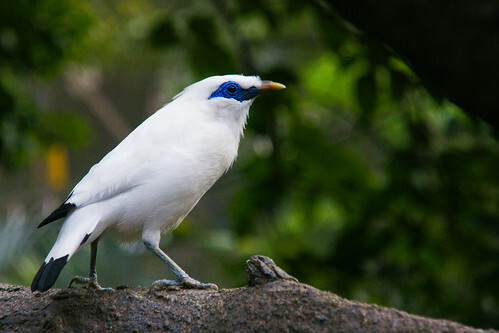 The Bali Mynah is a stocky perching bird related to starlings. In fact, the species is also known as the Bali Starling. Bali Mynahs are almost completely white, with black at the tip of the tail and wings. They also have a long drooping crest and a bright blue patch of skin around the eye. Tomorrow's bird is a small North American bird with a red crown. Can you guess what it will be? For 18 days we're adding a new Birdorable bird every day as part of our Birdorable Bonanza 2010. 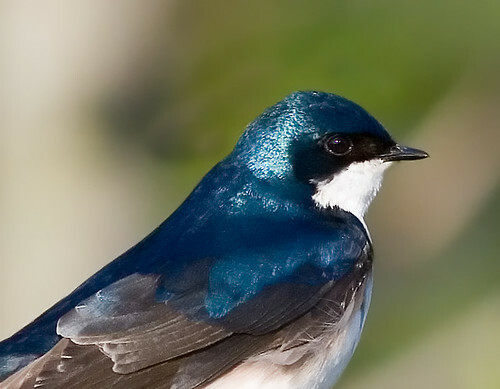 Today's bird is the Tree Swallow! Tree Swallows are relatively common North American breeding birds that nest in cavities. They will use nestboxes when natural cavity nesting sites are unavailable. Tree Swallows are extremely agile in flight. They are adept at catching their primary food - insects - on the wing. Tomorrow's bird is a critically endangered bird that is endemic to Bali, Indonesia. Can you guess what it will be? For 18 days we're adding a new Birdorable bird every day as part of our Birdorable Bonanza 2010. 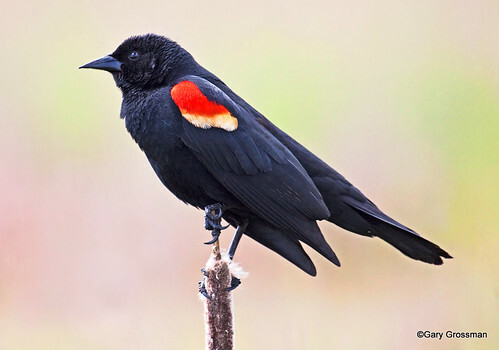 Today's bird is the Red-winged Blackbird. Red-winged Blackbirds are closely related to orioles and grackles. Here in northern Illinois, where we live, Red-winged Blackbirds are an early sign of spring. They return to nest in our county each after spending the winter further south. Hearing the first Red-winged Blackbirds calling on territory with their distinctive "konkaREE!" cry always means warmer weather is on the way soon. Tomorrow's bird is an aerial forager who nests in cavities. Can you guess what it is? For 18 days we're adding a new Birdorable bird every day as part of our Birdorable Bonanza 2010. Today's bird is the North American Wood Duck. Male Wood Ducks, like our new Birdorable, are beautifully plumaged. Iridescent green heads, brick-red breasts and sandy flanks are just part of the multicolored story. 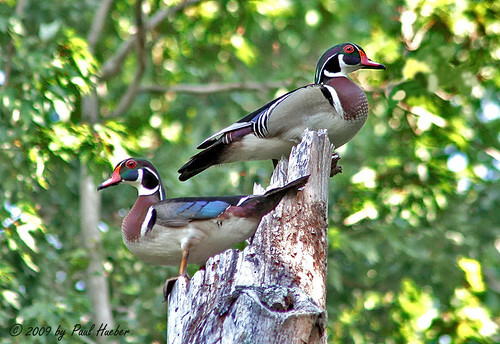 Wood Ducks nest in trees, or nest boxes. They are considered perching ducks, and it is not uncommon to see them perched high up in trees. 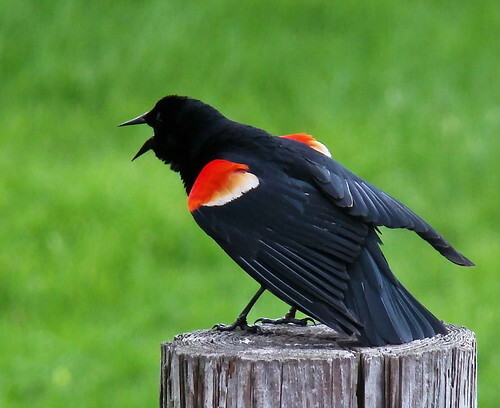 Tomorrow's bird likes to show off his red epaulets while calling. Can you guess what it is?